Immediate mold remediation is imperative to maintain a healthy life when the fungi are present. Mold is a fungus that grows when moisture is present and the affected area is untreated. Molds grow indoors and outdoors and are prevalent in warm and humid environments. However, certain mold can survive extreme conditions such as refrigerate temperatures and dry air. Mold can grow in several areas with in the home or a workplace that can cause complicating and irritating health problems. Some of the common indoor sources are, left out food, food stored to long in the refrigerator, roof leaks, cracked or broken pipes, water leaks, and holes in the building structures. specially when porous objects absorb the moisture, mold can result. Some health problems link to the existence of mold. A few conditions and symptoms include heightening the symptoms of allergies and asthma, respiratory problems, headaches, nausea, diarrhea, and fatigue. Most symptoms will dissipate as the source of the mold is eliminated. It is important to report or call a mold removal service for inspection if this becomes a concern. 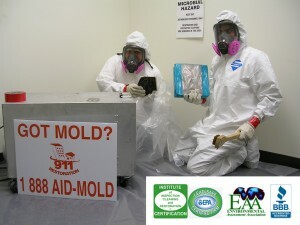 Mold removal services conduct mold inspection to identify the existence and cause. Mold removal may require eliminating all infected areas. Additionally, the source to the introduction of excessive water or moisture will need repairs as well. These experts will be able to educate on the subject as well as provide the best possible and reasonable solution. Mold remediation can eliminate any further outspread as well as begin to improve the living conditions as well as the residents and occupants health.